Biography of Prafulla Chandra Roy (1861 - 1944) - Robolab Technologies Pvt. Ltd.
Prafulla Chandra Roy is one of the famous scientists of India and also founder of Bengal chemical & Pharmaceuticals. This was the first pharmaceutical company of India. Considered as one of the components of the Bengal Renaissance, Prafulla Chandra Roy was an eminent scientist, an exemplary entrepreneur, a patriot and a passionate teacher. Prafulla Chandra Roy was born on August 2 , 1861 in Raruli- Katipara village, in the district of Khulna (Now in Bangladesh) and died on June 16, 1944. His father, Harish Chandra Roy who was a landlord with liberal views belonged to a wealthy cultured family to Calcutta so that his sons could have higher education. Here, Prafulla Chandra was admitted to the Hare School. He took a great interest in books and read a vast number of them. But a severe attack of dysentery forced him to leave the school. The disease was slowly overcome, but it permanently injured his health; he became a life-long sufferer from chronic indigestion and sleeplessness. When barely ten years old, he learnt Latin and Greek. He also studied the histories of England, Rome and Spain. Two years later, Prafulla Chandra resumed his studies and in 1874 joined the Albert School. 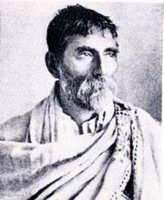 But Prafulla Chandra suddenly left for his village, without sitting for the examinations. In the village he mixed with the simple villagers and shared their joys and sorrows. He helped them in many ways.